The biggest (and least expensive) change in the living room is that we took one wall’s contents and switched them with the contents of the other wall. We kinda eyeballed the lengths so thankfully everything fits in the space. In doing so, we also had to move our seating to face the television’s new home. Rather than being lined up along the window, the couch now sits perpendicular to it. Because our couch came in three pieces and was much too wide to fit in this new direction as all three pieces, it’s now two pieces with one piece hanging out in our storage area until further notice. Moving the couch cleared up space for the planters by the window, so that’s a plus. These are the two Ikea plant stands that we brought home, along with a few pots for our new plant family. The one on the left was one I’d seen at the sister’s house, so I was definitely copying her great idea. Some other “easier” plants were also gifted to us from a friend who saw that I was building up a small plant family. So far, Fernie Sanders is the only one not doing so great, and occasionally our Fittonia will faint from lack of hydration. 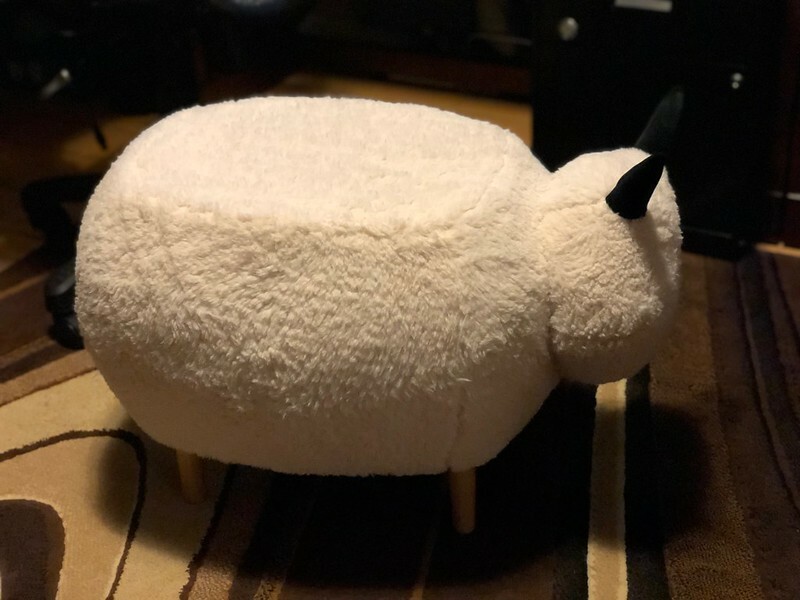 Another great idea from the sister’s house was this Sheep Ottoman. Yes, we now have one of these in our house. Ryan had a great time bringing it home from work on the bus. Fresca was suspicious of it at first, but we think she’s now accepted that it’s an inanimate object in the house. In total, we spent around $225 for this round of changes. Could we have done it cheaper? Absolutely! In our past refreshes of living spaces, we’ve scoured the Buy Nothing Facebook groups for freebies (some of our decor) or bought used (hello purple couch!). How often do you redecorate your home, and what’s your preferred way of doing so?